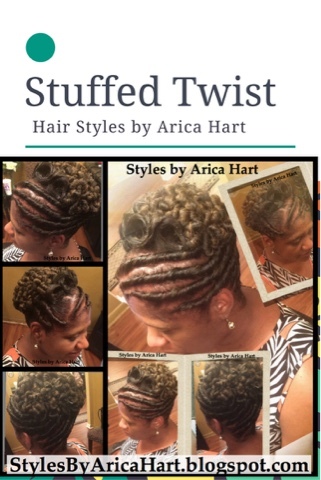 Stuffed twist with pincurls hair Styles by Arica Hart. Busy? Pin and share it for later! Are you ready to get up and go? Are you ready to be up to date with the latest fashion and hair styles. Well be ready to step out decent and in style! Try a stuffed twist hair style. This fabulous young lady is wearing a stuffed twist hair style. The twist are designed with braid hair. A few pincurls are sculpted across the top giving it a touch of elegance. This protective hair style is stylish and helps you keep the heat appliances out of your hair. Busy? Pin and share it for later. How to obtain and retain moisture in the hair. 10 MISTAKES TO AVOID IN CARING FOR YOUR HAIR.